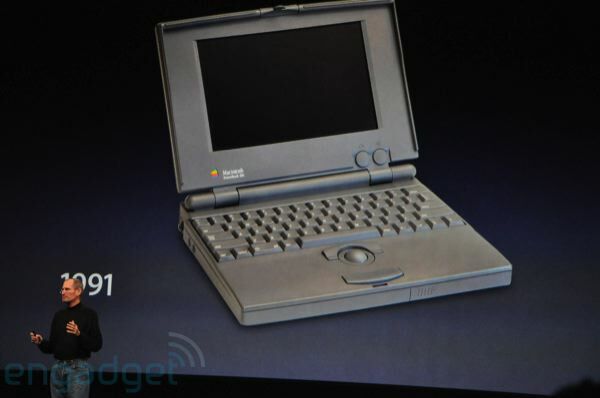 Updates first then "new magical, revolutionary product"
"Let's go back to 1991, when we first shipped our Powerbooks. The first with a TFT screen, the first with palm rests, and had an integrated pointing device. Just a few years ago in 2007 we reinvented the phone... and a few years later we got the iPhone 3GS." "SO all of us use laptops and smartphones... the question has arisen; is there room for something in the middle. We've wondered for years as well -- in order to create that category, they have to be far better at doing some key tasks... better than the laptop, better than the smartphone." "What kind of tasks? Browsing the web. Doing email. Enjoying and sharing pics. Watching videos. Enjoying music. Playing games. Reading ebooks. Or it has no reason for being." 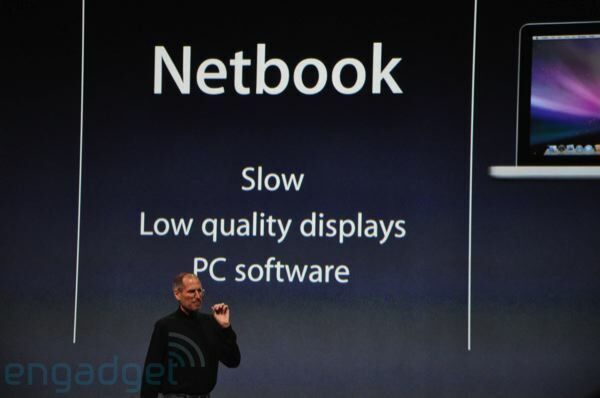 "Now some people thought that was a netbook -- the problem is that netbooks aren't better than anything!" Big cheers! Ha! "We think we've got something that is better. 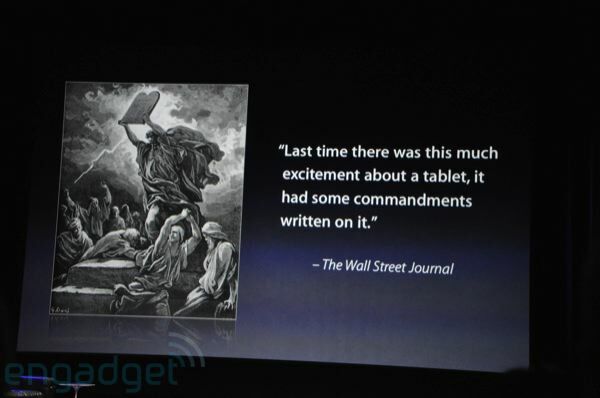 And we call it the iPad." "Album, photos... you can look at all of them, flick through them, it's a wonderful way to share. Calendar... months..." The interface really does look like an exploded iPhone. 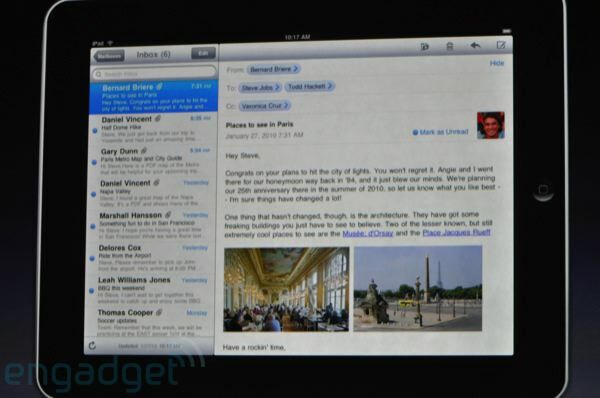 First up, he’s showing up Safari, going to Apple.com. Now he’s visiting the New York Times website. 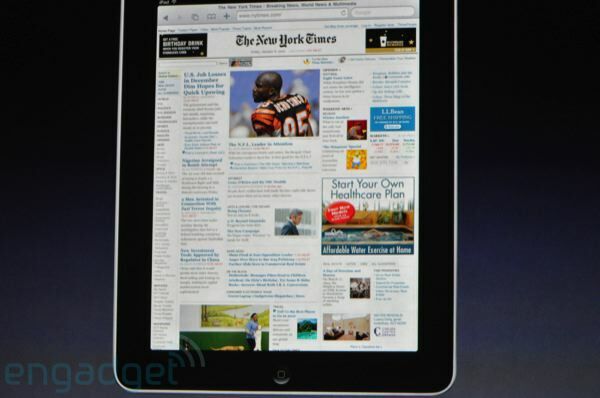 The page renders just like a browser’s, and there are the navigational buttons on the top. 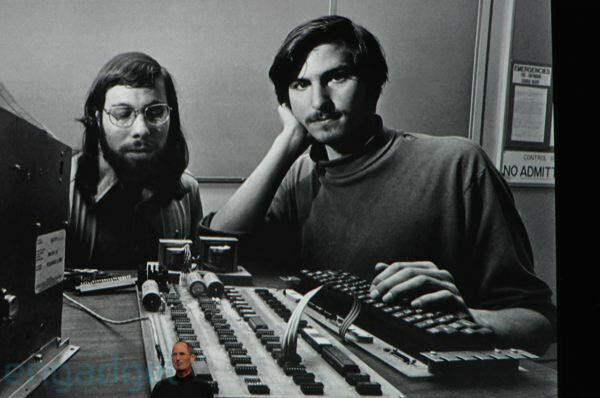 And to compose a message, click on compose and “up pops this gorgeous keyboard here.” Steve Jobs is typing actually NOT with his thumbs, but with fingers, like on a real keyboard. He’s placing it on his lap and typing away semi-naturally. But not without errors. 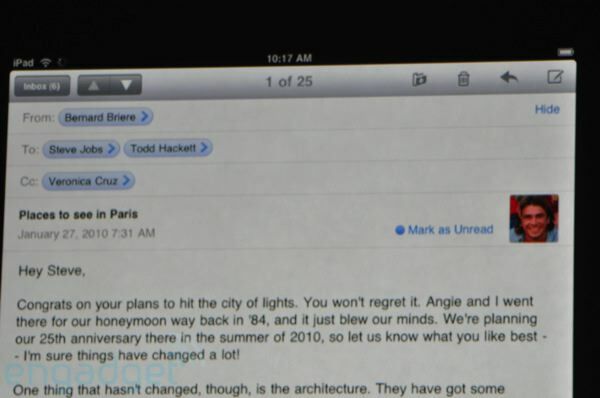 It’s a cross platform device, because he can sync photos with Mac and Windows, but if he’s on a Mac, you can get photo data like events and Places from iPhoto. 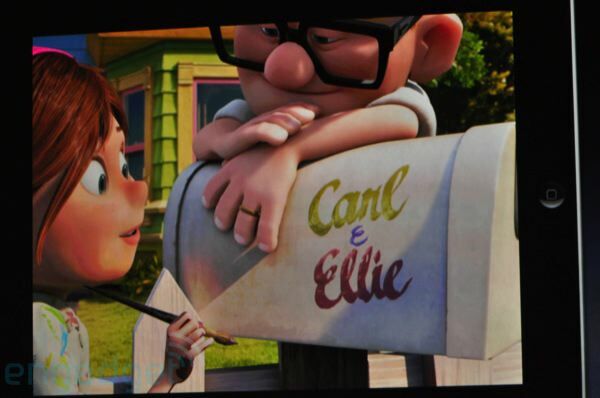 "You get the idea." Applause. iTunes. 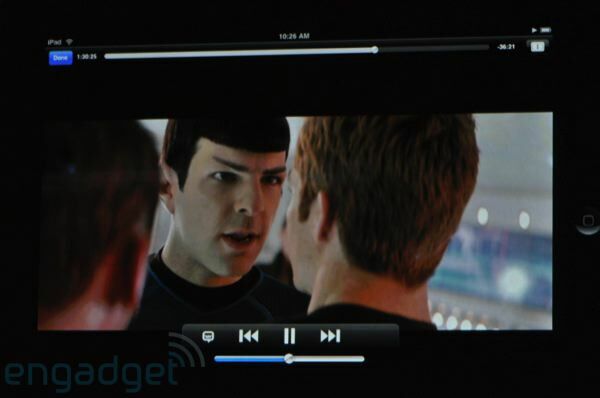 jobs is playing Dylan. Now, iTunes. 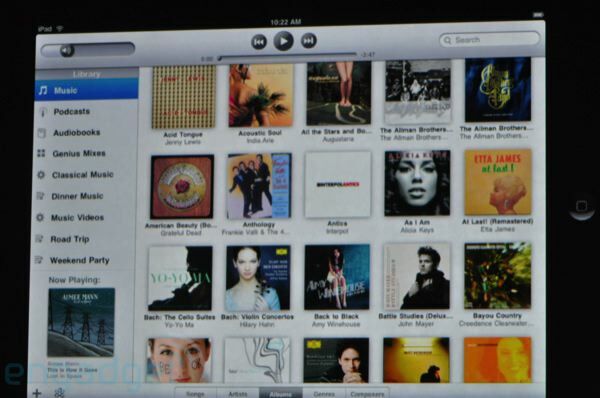 He can pull up songs similar to the new Album Cover view in iTunes, and he taps different album covers to bring up a list of songs in that album. Tapping a song there plays the song. 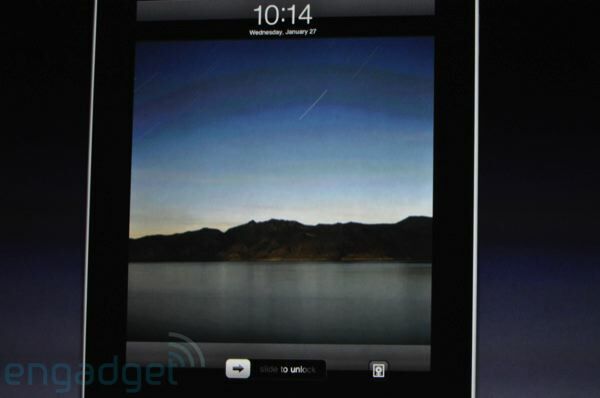 It’s more similar to iTunes on the desktop than iPod on the iPhone. Jobs jumped over to calendar, which looks really like the one on the desktop, except for a couple more views like Day and List, which looks more like an organizer book (a physical one). But what else? There’s a maps app, which is Google Maps (he doesn’t mention Google by name though!) Not yet, anyway. He’s loading up his current location, that means this has GPS or some kind of location sensing. But, there’s no icon on the top next to the Wi-Fi icon that shows a 3G connection. Apple's own processor 1GHz Apple A4 chip. Accellerometer, compass, speaker, microphone, 30-pin connector. Same App store. 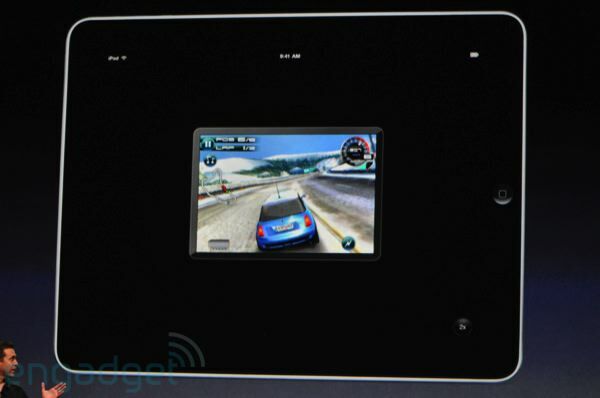 All current iphone apps will work, and they can run full screen. 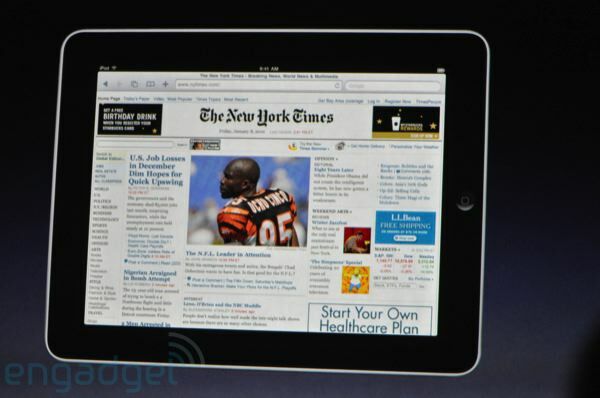 "So all of the iPhone apps will run on this. 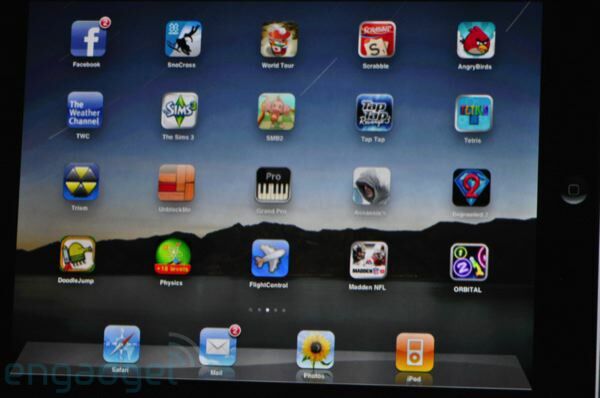 In fact when you buy it, download all the apps you have right onto the iPad. Now if the developer spends some time modifying their app, they can take full advantage of this display." 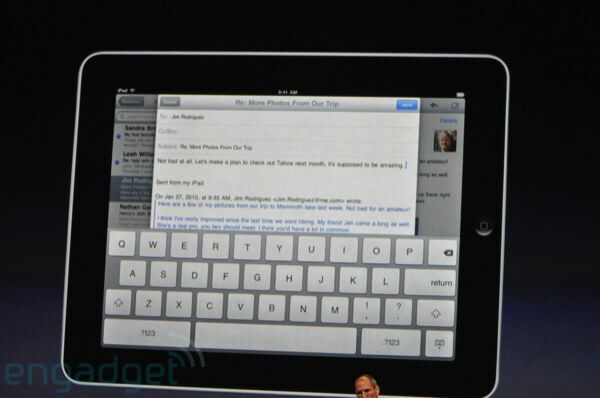 "We rewrote all of our apps for this display. 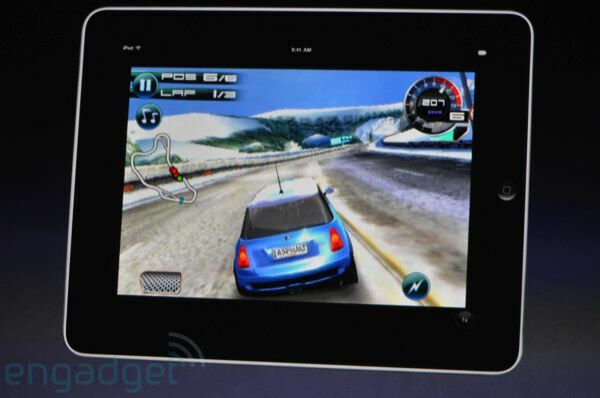 the iPhone SDK supports development for this now... and we're releasing it today."